This week's launch of Nokia's new X handsets has generated more headlines than you'd expect for a family of fairly low-end devices. That's because the Windows Phone-supporting, soon-to-be-part-of-Microsoft phone firm has embraced Android. Here's what you need to know: tech first, and then what it means for Nokia, Windows Phone and Microsoft. Which Nokia phones are running Android? So far we've seen three. The four-inch Nokia X and X+, and the Nokia XL – which is a five-incher. What does the X represent? It's the cross between Android apps, Microsoft services and Nokia hardware, apparently. Nokia design for cheap-Android money. 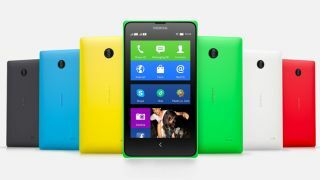 The Nokia X is €89, the X+ €99 and the XL €109. They're not going to delight specs fiends - you're looking at 1GHz Qualcomm Snapdragons with 512MB of RAM (768MB on the X+ and XL), and you can forget about PureView cameras or wireless charging - but that's not who they're aimed at. They're perfectly decent phones with rock-bottom prices and nice design. Where will they be sold? For now, the X range will be sold in Asia, South America and Eastern Europe. There are no current plans to bring it to Western Europe, North America, Australia, Korea or Japan. Is Nokia using the same Android as Samsung? No. There are actually two Androids: the one we're all familiar with that comes with Google Maps and various other Google services, and the Android Open Source Project (AOSP), which doesn't. AOSP is available to anybody who wants it, and they can do what they like with it - but if they want to include key Google services such as Google Maps or Chrome, they need to pay for a Google Mobile Services (GMS) license. Nokia is using the AOSP version of Android. Has Nokia paid for a GMS license? No. Instead of Google services, the X phones will use Nokia and Microsoft services such as Skype, Here Maps, Bing, OneDrive and so on. Which version of Android is Nokia using? Nokia's fork is based on Android 4.1.2 Jelly Bean. The skin is based on FastLane, the interface already used in Nokia's Asha devices. It looks rather like Windows Phone, which is entirely deliberate. Jelly Bean? That's quite old, isn't it? It is: it's been out since late 2012. The more recent KitKat, Android 4.4, has been specifically optimized for low-end hardware and would run better: we found the phones were "a little jittery". The use of a comparatively old Android suggests that Nokia has been working on this for a while. Do the phones use Google Play? No. Nokia has its own app store. Will it be a crap app store? Nokia says no: it promises hundreds of thousands of apps. Will there be lots of third party apps to choose from? Nokia says developers will find it simple to port their apps to its flavor of Android. It's produced three APIs (Application Programming Interfaces) for maps, app notifications and payments to replace the Google services its version of Android lacks. Can I get apps from elsewhere? Yes. In addition to the Nokia store you'll be able to download apps from third-party app stores, and you'll be able to sideload apps too - although of course, as with any sideloading it's important to make sure you're getting your apps from trustworthy sites. Has Nokia basically 'done an Amazon' here? Yes, it's the same thing Amazon did with the Kindle Fire. It's an interesting move, because a forked Android is essentially yet another mobile OS for customers to consider. Has Nokia dumped Windows Phone? No. The official line is that the low-cost Android devices will introduce "the next billion" users to Nokia kit and Microsoft services. The reality is that Windows Phone is getting stuffed in the low end market by increasingly impressive and affordable Android devices, and that's still an important sector for Nokia. By making low-cost Android devices, Nokia believes, it can get new phone buyers to develop a Nokia habit. How does Microsoft feel about it? That's a very good question. Windows Phone vice president Joe Belfiore was asked specifically about it at MWC, and after an awkward pause he said that as far as Microsoft was concerned, "some things [Nokia does] we're excited about, some things we're less excited about." If this were Old Microsoft, we'd expect Nokia's Android adventure to end as soon as the ink was dry on the contract making Nokia a Microsoft subsidiary. Now that Microsoft's under new management, we're not so sure. These phones might not be shipping Microsoft operating systems, but they will be connecting to Microsoft services such as email, messaging and search. If they prove to be a hit, killing the range might not be the best move for Microsoft to make. That's a very big if, however, and the X range could end up as not just the first Nokia phones to run Android, but the last too.